Progress ! - He's just this guy, you know. 01:21 am - Progress ! 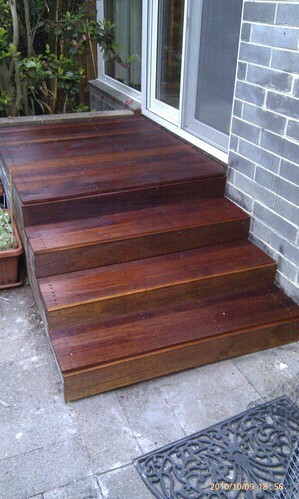 Yes, the back steps (aka Melbourne's smallest deck) are finally just about finished. 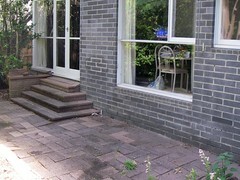 As you can see in the first photo (click through for a larger version), the back steps and patio were looking a little neglected and uneven - the steps had sunk 5cm or more from their original position, and tree roots had made a mess of the paved area. The other problem with the steps is that there's some sort of regulation which says there should be a 1 metre level area beyond external doors like that, meaning that simply attempting to raise the steps back up again wasn't an option. We asked a builder for a quote to level out the patio, and build a mini-deck over the steps - and quickly gave up on that idea when it came in somewhere over $10,000 (our theory is that he just didn't want to do the job, so gave a ridiculous quote to discourage us. Or maybe I just have no idea how much builders cost :-) ). So, it was DIY time, and on the patio side, ran for weeks and weeks of digging and cursing at tree roots, but it was eventually done. The steps took a while too, but they're finally (almost) done - only a balustrade of some sort left to complete it. Whew ! Next project is either building more bookcases, or painting more of the house ... probably the bookcases. Wow, they have ended up being really awesome. Job well done! Lovely! Remind me that we're coming up on deck oiling season again. Sigh. Very nice. i was going to say if you know kerri and George you should go and check out their deck sometime. The guy they had do it did a rather speccy job.